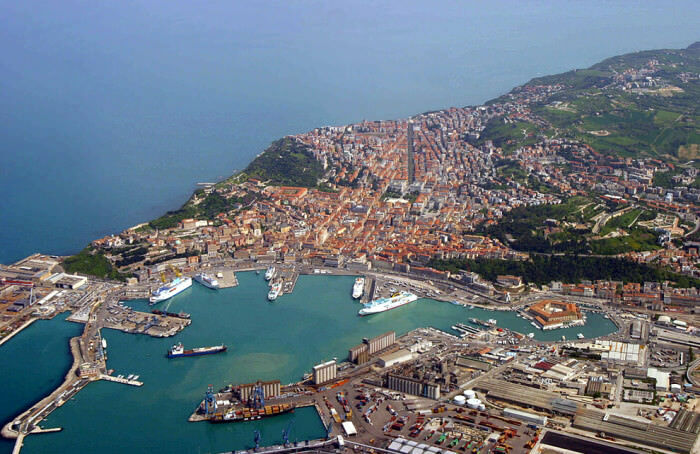 Ancona, a few miles from the B & B Montegallo, is the capital of the province and the Marche region..
Overlooking the Adriatic Sea, has one of the most important Italian ports. It is an Art city full of monuments and 2,400 years of history, is one of the main economic centers of the region, as well as its main urban center in size and population. Founded by the Greeks who gave it the name of Ἀγκών (ANKON, elbow) since it is located on a promontory elbow shaped that protects the natural harbor, was throughout history an important Roman port and in the Byzantine, the crossroads of trade routes to the east. Its location near the Monte Conero that opens onto the sea in a picturesque location, earned her the nickname Gateway to the East. Often in conflict with Venice for supremacy of trade routes in the Adriatic Sea, was subsequently annexed the Papal States and was the scene of major battles during the Risorgimento and the unification of Italy in the decisive Battle of Castelfidardo on 18 September 1860. Its landmarks are the Cathedral of San Ciriaco, overlooking the sea, whose Romanesque style blends with the Byzantine and the Passetto, a large terrace that offers breathtaking views of the Riviera del Conero. Impossible not to mention also the Arch of Trajan, the Citadel, the Lazaretto, the churches of Santa Maria della Piazza and S. Francesco alle Scale, all sites of great beauty and historical and cultural importance. Also beautiful beaches, especially Portonovo, known seaside resort and artistic, looks out onto the bay, attracts thousands of tourists every year during the summer.